V-Guard Industries Ltd (BSE: 532953, NSE: VGUARD) counter in BSE, on Thursday, saw a significant purchase of 4.15 lakh shares by the Singapore based FII, Nalanda India Equity Fund Ltd. The buy was disclosed at Bombay Stock Exchange after trading hours on Thursday. Nalanda Capital Pte Ltd, which is a PE firm promoted by former Warburg Pincus India Chief Pulak Prasad has been V-Guard’s largest non-promoter shareholder, and had upped its stake through market buys, recently. Through its two funds, Nalanda India Fund and Nalanda India Equity Fund, this FII held 5.03% in the Kochi-based electrical and electro-mechanical appliances manufacturer, as per their latest disclosure filed after an early June buy of 0.04% stake. Thursday’s buy is much more significant as 4.15 lakh shares amounts to a 1.39% stake in the small-cap company. However, the sheen of the buy is partly dulled by the fact that there was a matching seller on Thursday, when Sheela Kochouseph, a key promoter group person, offloaded 4 lakh shares. 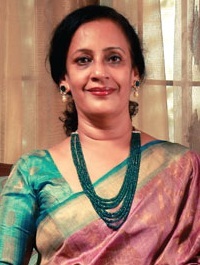 Sheela is the wife of V-Guard Founder and Executive Vice-Chairman Kochouseph Chittilappilly, and mother of Managing Director Mithun K Chittilappilly. Though she doesn’t occupy any directorship or executive post in V-Guard, Sheela was the fourth largest promoter shareholder behind Kochouseph, Mithun, and her elder son Arun Chittilappilly, with a 13.29% stake. With Thursday’s sell of 1.34% stake, Sheela Kochouseph’s holding now stands at 11.95% stake, while the total promoter group stake is down from 67.38% to 66.04%, which is still quite healthy by Indian standards. Though the promoter sell on Thursday is definitely signalling the achievement of satisfactory valuations, and a temporary ceiling for the rally in V-Guard stock, the sell might also have been for raising funds, as she is also an entrepreneur in her own capacity, running apparel maker V-Star Creations as its Managing Director. Sheela has raised Rs. 10.40 crore on Thursday’s sell, while Nalanda India Equity Fund has pumped in Rs. 10.77 crore to pick up the stake. The promoter group had upped its stake slightly in Q4, when Managing Director Mithun had bought 10,572 shares amounting to a 0.04% stake. But, in any case, V-Guard stock is likely to take a temporary breather now, having run up steeply from last week of May. On Thursday, the stock marked a new 52-Week High of Rs. 260 in BSE, before closing trade at Rs. 246.45 which is still in green by 4.98%. Nalanda picked up shares at Rs. 259.60 a share, while Sheela Kochouseph managed to sell at Rs. 260 a share. Thursday’s high is also V-Guard’s all-time high, and the scrip has proved to be a multi-bagger for its early investors, appreciating to over 3X times from its March 2008 IPO price of Rs. 82, and to over 7X times from its all-time low of Rs. 36.50 in October 2008. On the fundamental side, V-Guard’s strengths are its low equity base of Rs. 29.85 crore which has not been diluted since its IPO, as well as its asset-light business model. The company which made its initial name in voltage stabilizers for home appliances in the South Indian market, soon diversified into many electrical appliances like water pumps, fans etc as well as electrical cables. It has also spread geographically in India, with most key markets now covered. V-Guard’s product portfolio is noted for low-technology appliances, that once developed by the company are outsourced for manufacturing to Self Help Groups (SHGs), which keeps its capital requirements very low. However, on the flipside, most of its products are in extremely high-competition categories, and V-Guard has been relying on a high advertising budget to drive sales. Also, its cable division is capital intensive, and has been largely a volume driver rather than a margin driver till now. The fundamental numbers continue to be good, with FY’12 witnessing a 36.75% growth in revenue and 19.14% growth in net profit. The firm is, so far, known for better corporate governance practices, compared with its peers, and the stock has often proved to be a relatively safe small-cap bet when picked up during severe market corrections. For example, from its 52-Week Low of Rs. 141.25 recorded during market’s December lows, it has soared to a 52-Week High of Rs. 260 on Thursday, which is a 84% gain within six months. V-Guard Group is distinct from V-Guard Industries Ltd, with unlisted group companies like V-Star Creations Pvt Ltd and Wonderla Holidays Pvt Ltd (running amusement parks in Bangalore & Kochi), not being subsidiaries of the listed V-Guard. However, all companies are promoted by the same business family. Institutional holding in V-Guard is at 9.64%, dominated by FIIs, and has shown a slight up-tick in Q4. Apart from Nalanda Capital, largest non-promoter holders in the stock include Sundaram Mutual Fund and Emerging India Focus Funds.